As a lifetime partner with my hubby and caregiver for my two dogs, I deal with a lot of “stuff”; but this post isn’t about the dogs. It’s not even about my hubby. It’s about human specialized medical practices. And, as the title of this post suggests, I’m just going to vent my frustrations and then let them go. My main frustration is with the power that hospital systems have over doctors and their ability to meet their patients’ special needs. And then there’s the frustration with doctors who take it personally when their patients refuse referral to another specialist 200 miles away just because of their particular hospital affiliation. That recently happened to us (a second time) this past week. Hubby’s gastroenterologist wants him to see a specialist 200 miles away. We explained to him – as politely as we could – that we cannot and will not travel that far. We are not about to inflict the physical, mental, emotional and financial hardships upon ourselves that would come with such travel. Surely there are other esophageal specialists much closer to home to whom he could refer us. Despite our refusal, this doctor – who has been treating hubby’s gastric issues for a minimum of 15 years – has his office set up an appointment with said specialist. When we received the appointment notice, we called the local doctor and told his nurse, in no uncertain terms, that we are NOT traveling 200 miles to see said specialist. A few days later, the nurse called back and said that the doctor was referring us back to our primary care physician for this and all future gastroenterology issues. In other words, unless you go see the specialist affiliated with our hospital, you are no longer our patient. Whatever happened to compassion and working with the patient to assure that all his/her needs are met, including the emotional needs that go hand-in-hand with the medical needs?? Apparently, the Hippocratic oath they all take – or at least used to take – does not count for s**t any more when they sign an affiliation contract with a particular hospital system. Okay, so I’ve vented my frustrations with the medical care system in this country. Now it’s time to let it go. Thanks for letting me bend your ear for a few minutes. Well, here we are again. As I told you in Part 1, we decided to try two products for the March review. For “Part 2”, I was looking for a treat that I could give Shadow that wouldn’t aggravate her reflux issues. 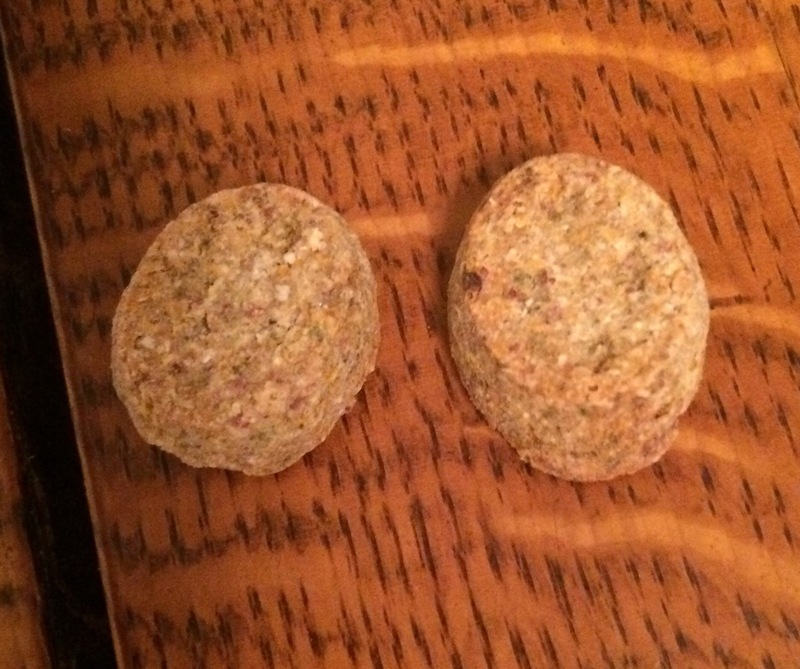 Through trial and error – and a lot of experimenting – I have found that she has the least trouble with soft treats without grains. But she misses the hard treats that she has to chew in order to savor and really enjoy. 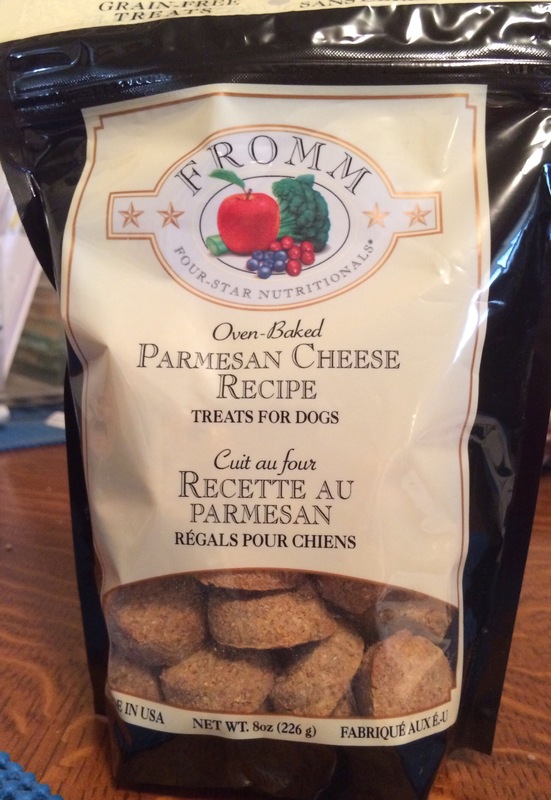 Have you tried Fromm’s Four-Star Nutritionals dog treats? Head over to Chewy.com and get some for your dog. Disclaimer: As a Chewy Influencer, I received one bag of Fromm Four-Star Nutritionals Grain-Free Parmesan Cheese Recipe Dog Treats from Chewy.com in exchange for an honest review. I received no other compensation for this post. 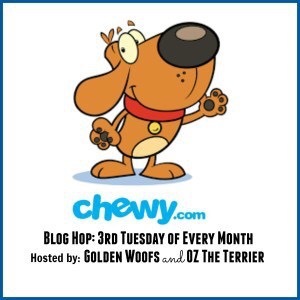 Ducky, Shadow, and I would like to thank Sugar the Golden Retriever and Oz the Terrier for hosting this Chewy blog hop.